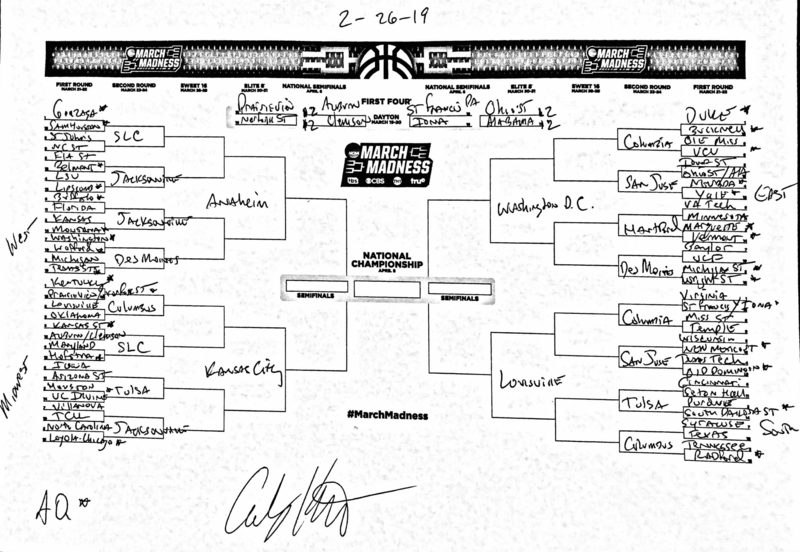 In the last week before March arrives, we have our latest prediction for the March Madness field, thanks to NCAA.com basketball expert Andy Katz. Katz has traveled the country this regular season watching games and talking to top players and coaches, all of which have helped inform his eighth bracket prediction of the season for the DI men's basketball tournament. We break down his picks below, but first, let’s look at the bracket itself (Tap or click here to open the bracket in a new window or tab). 8 St. John's Louisville Ole Miss Mississippi St.
12 Belmont Auburn/Clemson Ohio St./Alabama New Mexico St.
14 Montana UC Irvine Vermont S. Dakota St.
Kentucky has stayed hot in the second half of the season, sitting at 13-1 since January 5. That lone loss came at home on a last-second tip against No. 19 LSU, but in the meantime, the Wildcats toppled No. 1 Tennessee by 17. After the Vols lost to LSU on Saturday, Katz switched the two SEC teams, tabbing the Wildcats to win the conference and take the 1 seed, while Tennessee dropped to a 2 seed. They could very well flip again, as the rematch comes in Knoxville this Saturday. By the time February rolled around, it looked as though Villanova had recovered from some early-season stumbles and was back on track. The Wildcats won 11 in a row from Dec. 22 to Feb. 6. But the month has not been kind to Villanova, who have lost four of their last five, including three in a row. That makes five losses to unranked teams this year for the Wildcats — more than they’ve had in any season since 2013, when they went 20-14. The slump has dropped Villanova from a 5 seed to a 7 in Katz’s latest bracket. Up next is a rematch at home against No. 10 Marquette on Wednesday — the last opportunity to get a signature win in before the end of the regular season. Louisville has been extremely streaky this season, not having won more than six games in a row all year and sitting at 18-10 on the season. Yet they also have four wins against Top 25 teams. But since the start of February, the Cardinals are 2-5, including a disastrous blown lead against then-No. 2 Duke at home. After getting blown out at Syracuse and falling to Virginia, Katz penciled Louisville in as an 8 seed, down from a 6 seed in last week’s bracket. Georgetown showed its potential with a double-digit win over Villanova last week, stopping a two-game skid, but immediately followed it up with a 13-point loss at Creighton Saturday. The Hoyas haven’t been able to pick up any momentum this year. They haven’t won three games in a row since January 2, and are 5-8 since then. As a result, Katz dropped Georgetown from a 12 seed in his last bracket to the first four out of the tournament in this prediction. NC State has recovered fairly well after a blowout loss in Chapel Hill to North Carolina. The Wolfpack are 4-1 since, with the lone loss coming to Duke in Cameron Indoor. That has pushed NC State to a 9 seed from an 11 in Katz’s latest prediction. The Wolfpack should be able to carry this momentum through the end of the year, with the hardest test coming Saturday in Tallahassee against No. 18 Florida State. Cincinnati is now 11-1 since January 10, dropping just one game on the road against No. 12 Houston. The Bearcats trail Houston by just one game in the AAC, and finish off the season against the Cougars on March 10 in a game that could decide the conference title. Either way, Cincinnati’s hot streak has seen them continue to rise in Katz’s predictions, as they now sit a 6 seed.